As part of the US 395/North Spokane Corridor (NSC) freeway project, a thirty-foot arched culvert was installed to carry Deadman Creek under the existing US 2 where the two highways meet. The culvert replaced an 8 x 8 concrete box culvert. We installed a motion-activated camera to see if the local wildlife would make the change in their wandering habits from crossing the busy highway to the new, wider and taller route. We were right! They love it. Dozens of deer have been captured by the camera and we also snapped a photo of this moose enjoying an early morning stroll. Have you ever wondered, “Wouldn’t it be cool to get my business name on one of those blue highway signs?” Sure, it would. We recognize that local businesses contribute to our local economy so we do our best to get the word out. Businesses can apply to the Motorist Information Sign Program (MIS Program). These are the blue and brown signs you see along highways and intersections that notify drivers of nearby gas, food, lodging, camping, tourist activities or 24-hour pharmacies. Prices for the MIS Program range between $1 and $2.50 per day for signs visible to both directions of travel. You can apply online and have your business on one of those signs too. You can also purchase advertising space at rest areas. We also allow businesses to purchase advertising space on six Washington State Ferry runs and at four terminals. 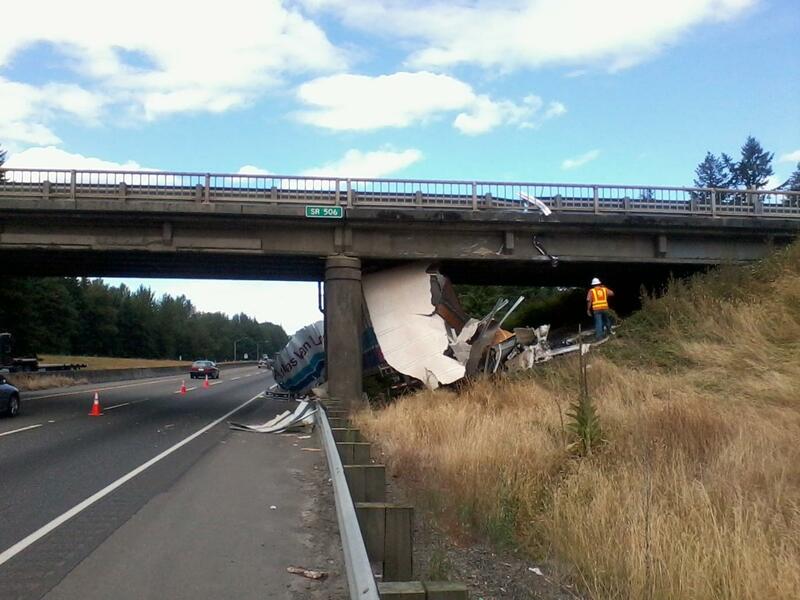 For more details, e-mail a WSDOT sales contractor. If you are part of a community organization, there are also things that you can do to advertise. Local organizations can paint murals that are visible to state highways as long as they do not contain distracting words or commercial advertising. You can also purchase off-site advertising space such as billboards by contacting a billboard company. You can also get your name on a highway sign by adopting a section of highway. We have to strike a delicate balance - providing safety for the motoring public and providing information about goods and services available near the highway. We don’t charge very much to advertise local businesses on signs, but we do make sure the signs are simple, informative and not a distraction. The business must provide a benefit to drivers. When it comes to signs, we try to be as flexible as possible to constituent concerns and needs. That’s why we try to find new ways to help people advertise and keep drivers safe from distractions at the same time. Learn more information about highway advertising. Back to school marks a change in seasons and a change in traveling for everyone. With school buses lining the streets and crossing guards posted at street corners it is important to be alert and aware on our roadways. That is why since 1946, AAA has conducted its annual School’s Open – Drive Carefully campaign in an effort to educate the public on important traffic safety messages and ultimately reduce school-related pedestrian deaths. This campaign helps support the work of more than 600,000 school safety patrollers in 31,000 schools across the U.S. Also, this year AAA decided to collaborate with Richard Scarry’s Busytown Mysteries to help spread the word about the importance of back to school safety. Take Your Time – Allow extra time for school zone traffic or adjust your route to avoid it. Avoid Distractions – Keep your eyes on the road and hands on the wheel. Focus on where you’re going, no matter how you’re getting there. STOP at Stop Signs. Treat a stop sign as you would a red light—come to a complete stop every time. Slow Down! – Speed limits in school zones tend to be 5 to 10 miles per hour below the posted speed. Brake for Buses – Passing a stopped school bus is against the law, so don’t do it. Watch for Walkers and Cyclists – Be cautious and prepared, especially on sidewalks and be extra cautious around driveways, intersections and residential neighborhoods. Cross at the Crosswalk – Keep to where you’re most likely to be seen, and where you have the right-of-way. Look for AAA School Safety Patrollers. If you see one of the more than 600,000 AAA School Safety Patrollers at 31,000 schools across the country, you know you’re approaching a school zone. There’s a ton of construction on Washington highways this summer, and when driving through work zone after work zone, it’s easy to assume that we are all about building roads. While our main priority is to invest in the highway system to keep drivers safe and moving, we have other projects that may not be directly connected to a state highway, but have tangible benefits that go way beyond moving drivers from point A to point B. We help bring those benefits to communities through our Local Programs department. Local Programs provides educational, technical and financial support to help local customers achieve their transportation goals. Projects currently under construction in southwest Washington include a downtown revitalization project in Castle Rock and an interpretive center in Morton. Both of these projects received grants through Local Programs, and the agencies in charge (the City of Castle Rock and the Cowlitz River Valley Historical Society, respectively) get continual assistance from Local Programs staff as the projects unfold. The town of Castle Rock is located along state routes 411 and 504 in central Cowlitz County. The town is home to about 2,000 people, and its main sources of commerce are I-5 drivers, recreational traffic and sightseers headed to and from Mount St. Helens. But the City has a vision for the future – making Castle Rock a place “where past, present and future come together.” To that end, they are revitalizing their historic downtown core with a little help from us. 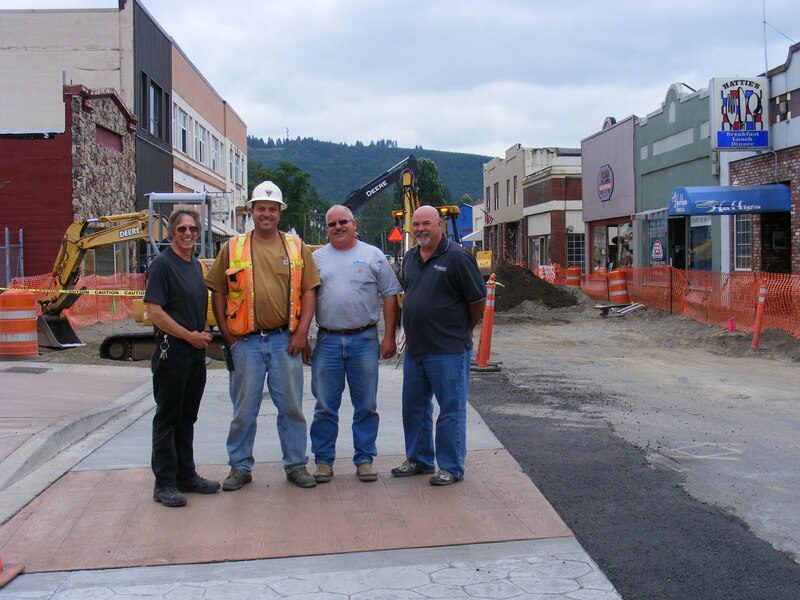 Local Programs helped the City secure $859,000 in funding for the reconstruction of Cowlitz Street West, the main downtown drag. The project updates the road and underground utilities, and highlights the area’s iconic mid-twentieth century storefronts. The new stamped concrete sidewalk resembles rough wood planks and recalls Castle Rock’s frontier and timber days. Business continues in the downtown core as excavators rumble past. Over a fantastic lunch at Lacey Rha Café, Castle Rock Mayor Paul Helenberg and Public Works Director Dave Vorse related the project as “a grassroots effort from the downtown businesses to rework [the city’s] identity.” Though the work affects business, owners are generally patient and grateful in the knowledge that the end result is worth the present pain. An hour northeast in Morton, construction work is less invasive but just as obvious in this small mountain town of just over 1,000 people. 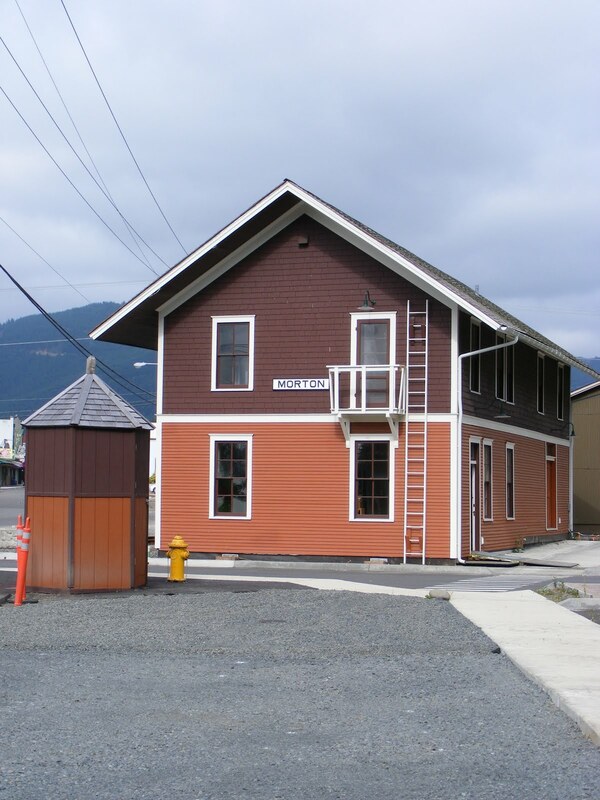 Morton was once a timber and mining hot spot, and that meant a lot of train traffic to move logs and ore from source to mill. Inactive railroad tracks still run through the east side of town, giving mute testament to the thousands of trains that passed through the area during its heyday. Morton’s “Milwaukee style” railroad station was built in 1910 and is the only one of its kind left standing today. It was moved from its original location in 2005 and is being restored to its early twentieth-century glory by the Cowlitz River Valley Historical Society (warning, turn your speakers down before entering this site, it's very musical), which plans to make the building into a train museum. The station sits just off of SR 7 and SR 508, and the society is working with the White Pass Scenic Byway to make the site a rest stop for travelers. In order to tie all this together and bring it to fruition, our Local Programs provided a $375,000 grant to build an interpretive center and restroom facility adjacent to the depot. The wooden “shell” of the interpretive center is currently under construction, and the restrooms are due to be delivered later this summer. Instead of building a traditional facility, we are trying something new: a pre-cast concrete building with six restrooms. This style of building is a first for us, and a great opportunity to “test out low-cost improvements…in the interest of both driver safety and historical significance,” said Safety Rest Area Program Manager Maurice Perigo, who is overseeing construction. So it may sound odd coming from an agency once known as the “highway department,” but take a drive off the beaten path every once in a while and visit some of the great sights along our state’s byways. You might just come across some unexpected surprises, thanks to the dedication and vision of our local partners, and our commitment to supporting the vitality of Washington State communities. This week a small group of WSDOT and Federal Highway Administration (FHWA) officials gathered in a conference room in downtown Seattle to watch something that will change the course of history in Seattle. With little more fanfare than snapping a few photographs, FHWA’s Washington Division Administrator Dan Mathis, signed the SR 99 Alaskan Way Viaduct Replacement Project’s Record of Decision. While the document has a long and bureaucratic title, its intent is clear. It means that we have successfully completed 10 years of environmental review and can now focus on final design and construction of the new SR 99 tunnel beneath downtown Seattle. with Secretary of Transportation Paula Hammond. So, what is a record of decision? In a nutshell, it’s federal approval of a project’s environmental review, and it describes the project the agencies have decided to build. A record of decision also includes any mitigation measures and commitments the project will need to implement. For the SR 99 tunnel, this list includes monitoring buildings and utilities during tunnel boring, replacing lost parking during construction and keeping neighbors and the public informed throughout the project. The signed document set in motion a flurry of activities to get tunnel construction started. One of the first things we did was give our tunnel contractor, Seattle Tunnel Partners, the official notice to proceed with final design and construction. Seattle Tunnel Partners, along with boring machine manufacturer Hitachi Zosen, will begin work this fall. When it opens in late 2015, the 1.7-mile-long tunnel will whisk traffic between Seattle’s SODO and South Lake Union neighborhoods. Once open, the tunnel will also allow us to remove the final stretch of double-deck viaduct along Seattle’s downtown waterfront. The Alaskan Way Viaduct is vulnerable to collapse in a severe earthquake, which is why we’ve been working so diligently to make its replacement a reality. A project to replace nearly half of the viaduct with a new above-ground roadway is already under way south of downtown and is designed to eventually connect to the tunnel. File this one under: How in the world? This is quite possibly one of the strangest semi vs bridge situations I've ever witnessed. This happened yesterday afternoon on I-5 near Toledo. 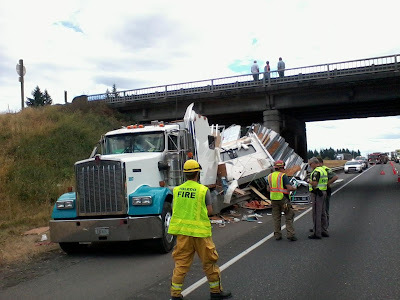 Somehow the driver managed to go under the bridge between the bridge pier and the hill. into the overpass. How he got there is quite the mystery. 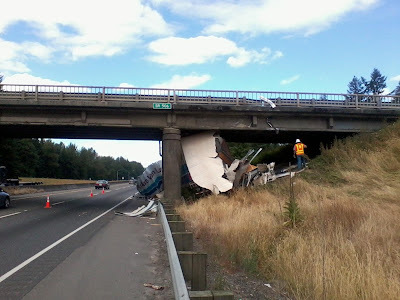 overpass had little to no damage. Luckily the driver suffered only minor injuries. His cargo however, didn't fare so well. Ever wonder why is SR 531 labeled east-west? We get a lot of questions from people who are curious about the highway system in Washington state. I thought I'd take the time to share one of the more interesting ones we ran across lately asking why state routes are given certain numbers. Emory of Arlington wrote to us and asked, "I was curious as to why Highway 531 is labeled an east-west route? It is my understanding that east-west routes are assigned even numbers and north-south routes are give odd numbers. Yet on either end of 531 and between each starting point there are signs posted "east" and "west" respectively?" After doing a bit of research, we discovered that Emory is correct that SR 531 is, indeed, an east-west highway, even though it has been assigned an “odd” number. It got the unusual designation on April 1, 1992 (seriously), when we took over the highway from Snohomish County. If you keep track of the state highways in Snohomish County, you’ll know that the numbering scheme doesn’t leave much room for flexibility. 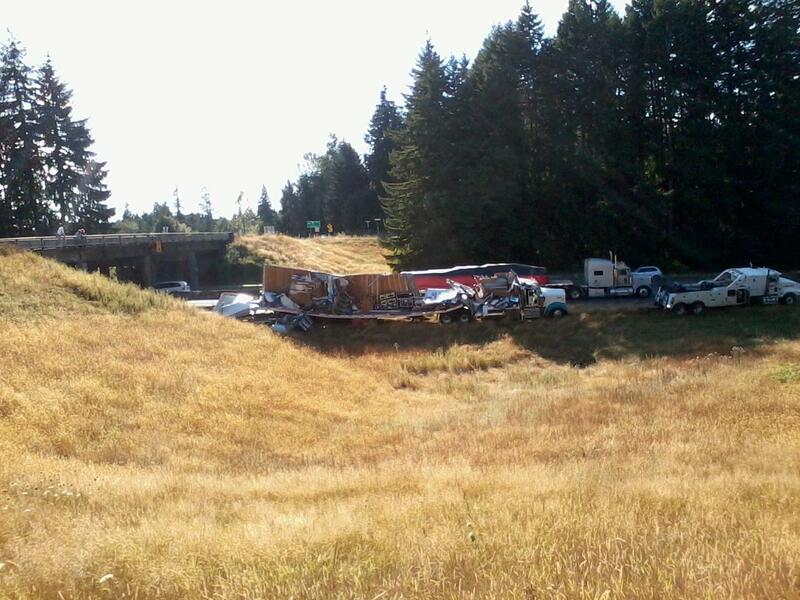 State Routes 526 and 527 meet up with I-5 in the Everett area, and SR 528 and SR 529 meet up with I-5 in Marysville. SR 530 crosses I-5 in the Arlington area, and SR 532 ends at I-5 in Stanwood. When we added this “new” state route in 1992, we only had one numbering option left: SR 531. Even though the highway is south of SR 530 and SR 532, and even though it runs east-west, the only number we could give it was an odd one. You can read more about how we number highways and interstates. Current view of the east end of the bridge interchange. Design visualization of the proposed new interchange. “You’re going to do what?” It’s a question we’ve heard a lot when people find that we’re going to use part of an elevated grocery store parking lot for a state highway. Frankly, it saves a ton of money and provides a great solution to a gnarly traffic problem. Traffic at the SR 285 Senator George Sellar Bridge over the Columbia River connecting Wenatchee and East Wenatchee averages more than 60,000 vehicles per day. We just finished a two year project that added a new eastbound traffic lane on the bridge itself and now the next phase to fix the connections on the east end of the bridge is beginning. Back in ’97 the community recognized traffic on both ends of the bridge was bad and getting worse. The resulting study documented the “bad” and generated solutions. On the east end, it showed 94 wrecks over four years. There was only one fatal, most were fender benders, but the societal cost analysis tallied a million dollars a year. At the same time, traffic studies showed that despite the 40 mph speed limit, the average was only 20 mph and if nothing changed by 2015, it would be down to 9 mph. The initial solution was a full blown grade separated interchange (underpass) at Grant Road which is the primary access into East Wenatchee. That’s still the long term plan, but it was a budget buster. An interim solution is to construct a bypass so the traffic not bound for downtown East Wenatchee doesn’t have to go through the Grant Road intersection at all. Work on the bypass is beginning in earnest after Labor Day and it should be done in 2013. The $16 million project constructs a two-lane, one-way bypass, around Grant Road, for southbound SR 28 traffic that starts at the off-ramp from the Sellar Bridge and reconnects to SR 28 south of 3rd Street SE. The current ramp to Grant Road will be removed and those who want to get to Grant Road will turn left off the bypass between Fred Meyer and Top Foods. We will also build a third left turn lane from SR 28 onto Grant Road and another lane on Grant Road. To build the bypass and stay as far away from the Columbia River as possible, the Fred Meyer parking lot offered a lot of benefits. First, it was already there which solved most of the environmental issues and second, the parking lot was built strong enough to accommodate the highway traffic. We bought the west side of the elevated parking lot and the rest of what we needed on the west side of Top Foods and designed one of the most unique roadways in our entire highway system. Phase three, which fixes the west end bridge approaches, goes out for bids next year. UPDATE (8.29.11)- Check out Secretary LaHood recent blog about the upcoming Labor Day Weekend and the Drive Sober or Get Pulled Over campaign. According to NHTSA, drunk driving claimed the lives of 10,839 people in 2009, approximately a third of all fatalities on our nation’s roadways that year. In fact, 87% of people surveyed feel that drunk driving is a very serious threat to their personal safety (page 7)—second only to distracted driving—and 98% say they personally consider driving while intoxicated an unacceptable act. As law enforcement gears up for their annual crackdown with a new campaign, Drive Sober or Get Pulled Over, it is clear that impaired driving remains a critical safety issue despite public perceptions. Changing this potentially deadly behavior is a long-term effort. Success truly hinges on drivers making the right decision at the end of the night to find a safe and sober way home. Combining highly visible enforcement with strong public education equals a recipe for success when combating such challenging safety culture issues as drunk driving, seat belt use and most recently distracted driving. Recognizing that laws are most effective if there’s a strong belief that they’ll be enforced, this national effort will be cracking down on impaired drivers. Respect the law, respect other drivers and respect yourself enough to remove drugs and alcohol from your driving equation. A single bad decision, like getting behind the wheel after a few drinks, may get you caught, killed or kill someone else. Reduce, reuse, recycle. We’ve all heard it before; some of us hear it in our sleep. But what does it mean to us? A good place to start looking for answers is inside a nondescript, two-story government building in Tumwater, where engineers and technicians are experimenting with ways to make the materials that go into bridges and highways last longer and live multiple lives. At our State Materials Lab, a concrete panel that was part of I-5 in a former life could soon become part of a new highway ramp or a culvert to help salmon make their way upstream. Take the asphalt you drive on every day, for instance. We’ve been recycling and reusing asphalt pavement for nearly 35 years. Today, the agency is a leader in an industry that now recycles nearly 100 percent of asphalt pavement nationwide. We maintain more than 20,500 lane miles on state highways and other roadways, almost enough to wrap a road around the globe. About 63 percent of those lane miles are topped with recycled asphalt pavement (RAP), which gets reused again and again. The Materials Lab takes a basic dollars-and-common-sense approach to their work. Simply put, they use chemistry and physics to get bigger bangs for dwindling bucks. In today’s climate – both economic and atmospheric – sustainability is just as important to our budget’s bottom line as it is to the environment. 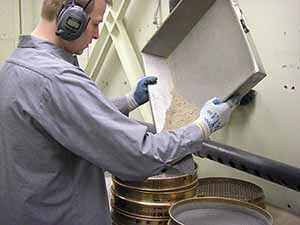 Innovations being refined and enhanced in the lab aim to trim the price of pavement by making it stronger and last longer. Other DOTs design and build asphalt pavement to last 20 years; then they replace it completely. We do it differently. Take I-90, for instance; that pavement is 43 years old, 3 4 inches thicker than the 20-year stuff and still going strong with resurfacing every 10-15 years. 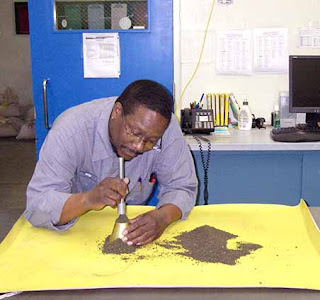 The lab is exploring new ways to cut cost and greenhouse gas emissions with new methods like hot-in-place (HIP), which recycles and reuses old asphalt without ever leaving the work zone. In recent years, the lab has changed paving as we know it in Washington by refining a method for mixing asphalt 50 degrees cooler than the standard 300 degrees before spreading it in on the road. Less heat means less fuel and less greenhouse gas spewed into our air. 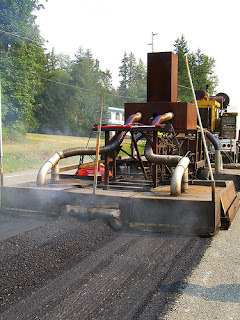 Today, the so-called warm-mix method of asphalt paving uses 20 percent less energy. When combined with RAP it cuts greenhouse gas emissions by 15-20 percent – about 3 million tons of carbon dioxide per year not fouling our air. Regardless of how you define sustainability, the lab uses science and technology to help us spend tax dollars more wisely and make highways, bridges and tunnels stronger, safer, longer lasting and gentler on the places we call home. It’s one of many ways we’re making transportation better. with business, city, state and legislative colleagues. 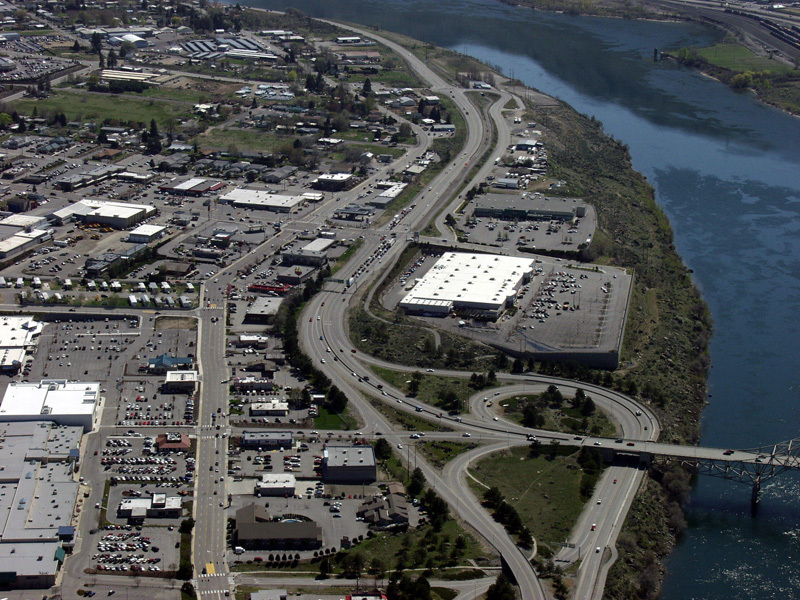 Approximately 25,000 vehicles enter and leave Selah, a small city in central Washington, every day; that’s almost as many vehicles that travel over Snoqualmie Pass. Although the population is only 7,000, nearly twice as many people live just outside the city limits that are part of the school district. Plus, there are a handful of agricultural companies that rely on easy access to and from Selah, one of which is Tree Top, a national company known for their fruit products. The state highway, SR 823, is also named S. First Street, the main drag through downtown. Yes, drag is an old term but appropriate for those who have waited in long backups at several stop lights as they idled through the city on their way home. Residents and commercial vehicles needed better access through Selah. Former state Senator Jim Clements supported the 2005 gas tax and helped put the Selah Re-route project on our to-do list. He is a long-time Selah resident and said this project is very special to him, and it will help businesses grow. 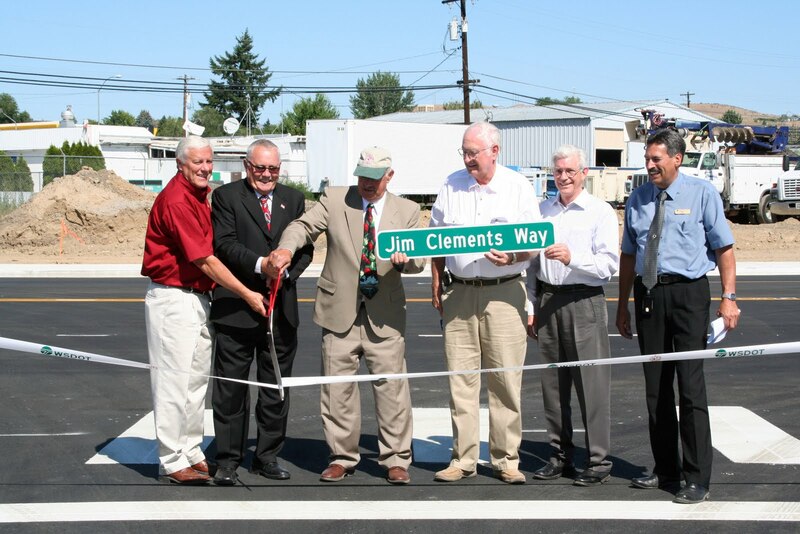 To honor Clements for his contributions to the community, the city renamed the new route Jim Clements Way. And at a July ribbon cutting, Mayor Bob Jones presented him with a miniature Jim Clements Way street sign as he thanked him for all of his years as a public servant. The first phase of this $9.3 million project, completed in July 2011, re-routes traffic away from the downtown core. Now that the new route is open, drivers traveling through Selah to destinations beyond the city limits and trucks hauling freight between the farms and markets can avoid stopping at the traffic signals on S. First Street. They can now bypass the city’s core, shortening the time and travel distance by several minutes and a ½ mile on the new alignment. The new route has two lanes with a center turn lane, relieving congestion on S. First Street. To improve safety and access for both pedestrians and vehicles, we installed traffic signals at the intersections of East Fremont and East Naches avenues and new sidewalks along Wenas Road. The best part of the project? It’s working. So far, 80 percent of the expected traffic from S. First Street is taking the new route. As more drivers learn about it, more drivers will use it. We are not done yet. Next year, crews will reconstruct and widen Railroad Avenue to better accommodate truck traffic as part of the final phase of the project. Next week (August 7-13) is National Stop on Red Week, a program started back in 1995 by the Federal Highway Administration to remind the public how important it is to pay attention to traffic signals and how dangerous it can be to try and sneak through an intersection as the signal changes from yellow to red. Red means stop is a lesson learned in elementary school and a fundamental building block of driver education. However, red-light running crashes are responsible for an average of 885 traffic fatalities a year—more than two fatalities a day—from 2000 to 2009, according to the National Highway Traffic Safety Administration. Most tragic is that these fatalities are 100% preventable. Drivers who run red lights typically are in a hurry, driving aggressively, are distracted or believe they won’t get caught for such a minor infraction. In fact, in a 2010 survey, more than one-third of motorists admitted going through a red light when they could have stopped safely in the previous month. Multi-vehicle or pedestrian-related crashes caused by red-light runners can be devastating, leaving fatalities or severely injured people in their wake. Waiting at a red light, especially when you’re feeling rushed, can be annoying and even make you late for work, but the results of running a red light can last a lifetime. If you’re still not convinced, check out the top 10 reasons to stop on red. Stopping at a red light is the law and it applies to everyone. Saving lives beats saving time every day of the week. 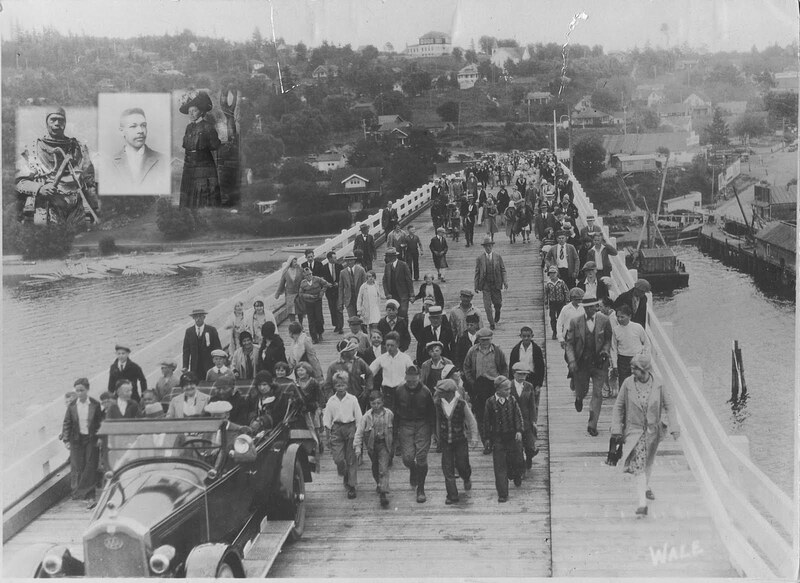 A community icon that was welcomed with open arms by residents of Bremerton and Manette 80 years ago was ushered out the same way last month. The Manette Bridge had served Kitsap County well throughout its long tenure across the Port Washington Narrows, but was showing its age, too. It closed for good to motorists at 10 a.m. Sunday, July 24. Even so, memories of the bridge will live on through the hundreds of people who attended a farewell parade that day and thousands more who have crossed it during their lifetimes. Crowds began gathering at the bridge early in the morning, to watch a classic car parade, swap stories and share their thoughts on the closing of one bridge and the opening of another. Our staff who attended the event brought commemorative posters to mark the occasion. They were hot items, indeed, and within an hour all 100 of the 11x17 posters had been snatched up by residents. Even then, dozens of people requested the unique image that shows the old bridge fading into the new one. In August 2010, we, along with the contractor Manson-Mowat, started the $60 million project to replace the old structure with a new, wider bridge that features 11-foot-wide lanes, 5-foot-wide shoulders, a 10-foot-wide pedestrian walkway, a new roundabout to better accommodate traffic flows and a renovated viewscape that overlooks the Narrows in Manette. 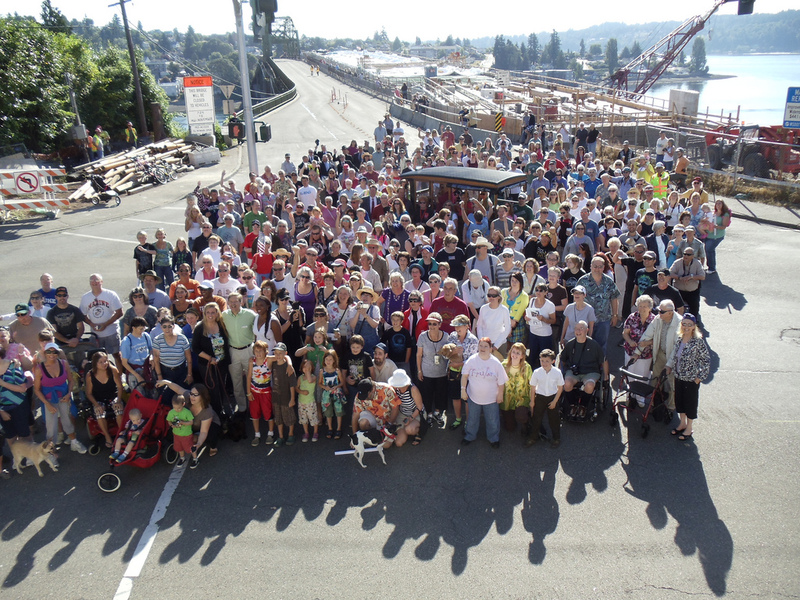 While residents in attendance at the farewell ceremony will certainly miss the old bridge, there was no question that the people of Bremerton and Manette were looking forward to the new one. They won’t have to wait too long, either. The new bridge is scheduled to open Nov. 10, bringing to end a closure period of about four months. If the July event was any indication of the excitement the community is feeling about the project, the opening will be a joyous occasion that recognizes the past and looks ahead to the future. Do you have a favorite memory of the Manette Bridge?